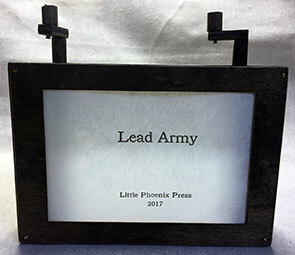 Jessica White: " Many of my books, prints, and ephemera are printed under one of two imprints: Heroes & Criminals Press or Little Phoenix Letterpress. H&C Press is usually reserved for artists books and related stuff, and it comes from my respect for people for do heroic deeds even if it includes criminal acts. I'm also interested in that fuzzy line between being a "good" person vs. a "bad" one, and that fun place in between where most of us live." Iowa City: Heroes & Criminals Press, 2009. Edition of 50. 5 x 7"; 34 pages. Dos-à-dos construction. Letterpress printed from metal type and photopolymer plates on Nideggan paper. Text in English and Chinese. Hornet's nest used for cover decoration on Twinrocker paper. 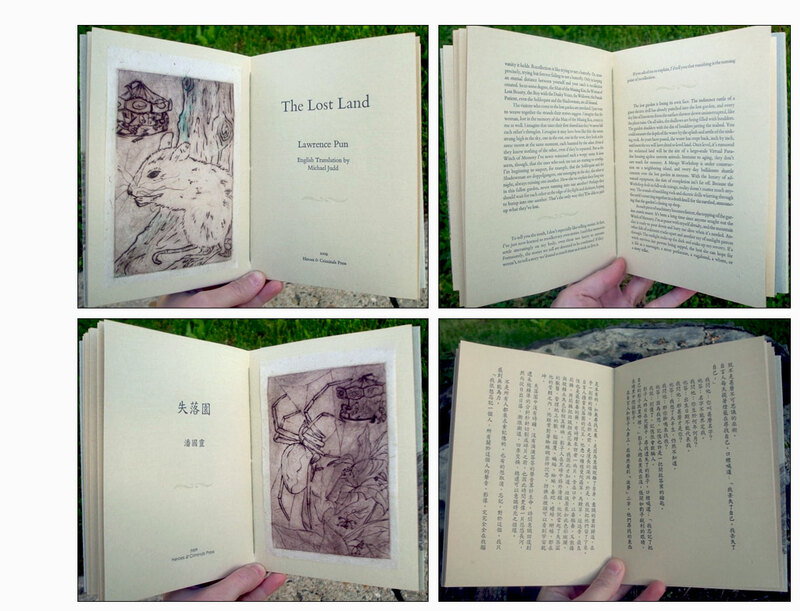 Includes two drypoint intaglio frontispieces by Jessica C. White. Cover of handmade Twinrocker paper. Cover paper decorated with segments of hornet's nest. Heroes & Criminals Press: "This book includes both the original Chinese and the English translation of The Lost Land, a short story about memories, life, and death in the guise of progress, by Lawrence Pun, a writer and teacher based in Hong Kong." This was Jessica White's Final Project for the UICB certificate. Lawrence Pun was in the International Writing Program in Iowa City. Jessica White: "This is a modern day fairy tale about Mnemosyne, a self-proclaimed 'witch of memories' living in a cave located in an overgrown and crumbling playground. People come to seek her help, but ultimately it's up to each individual to construct a personal past and future. In the end, it's Mnemosyne who has no control of her own destiny, and is buried in the destruction of these ancient sacred grounds for the sake of commercial progress. The story is by Lawrence Pun, an award-winning author based in Hong Kong." Iowa City, Iowa: Heroes & Criminals Press, 2007. Edition of 30. 4.75 x 6"; 10 pages. Printed from hand-set Palatino type on Arches Text laid paper at the University of Iowa Center for the Book. 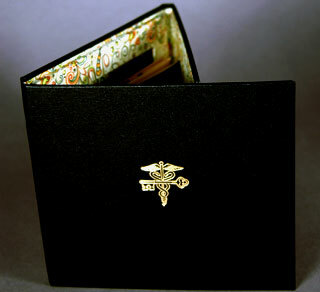 Hand-sewn stab binding. 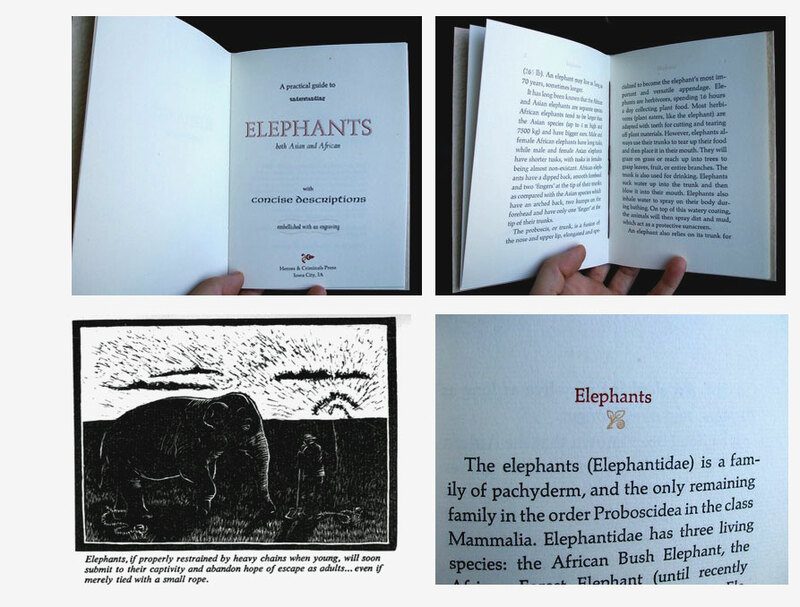 A chapbook about elephants, with original wood engraving. Text derived from Wikipedia, "copyleft 2007." Jessica White: "This book is dedicated to all bibliophiles who love to look at fine press books, not necessarily to read them." Asheville, North Carolina: Heroes & Criminals Press, 2013. Edition of 30. 14" x 20" x 5", scroll is 25 feet fully extended. 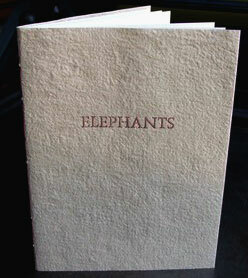 Letterpress printed from photopolymer plates and handset Palatino type on Okawara paper. Hand-colored with watercolor and walnut ink. Bound as a scroll on a cranking mechanism encased in a handmade box. 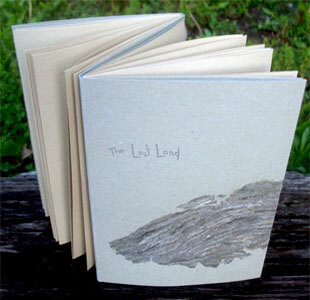 Includes a digitally printed version of the scroll as a small hand-held book. Each one is signed and numbered by the artist. Original story and illustrations by Jessica C. White. Printed and handmade by the artist as well. 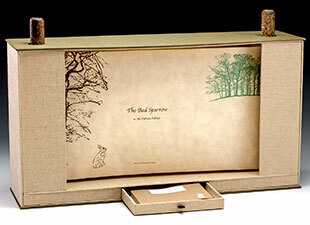 Jessica White: "This crankie tells a story that takes place amongst animals congregating in a woodland clearing. They are gathering to wage war based on something the sparrow said. As the battle gets underway, some realize that they’ve forgotten what was said, but continue to fight on. Even after the sparrow is shot down by an archer, the machine of war is unstoppable." 3.5 x 9.625" closed, extends to 42"; 13 pages. Accordion structure, last page attached to back board. Printed and bound at the University of Iowa Center for the Book from pressure prints. Handset Bembo on Rives Lightweight paper. 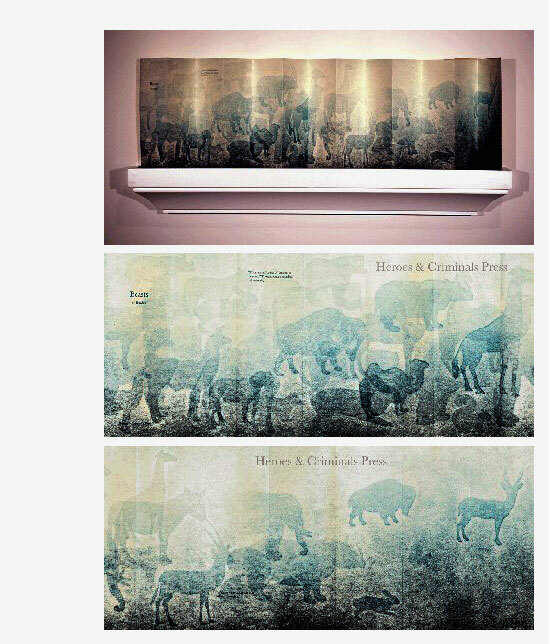 A ghostly panorama of animals with a quotation from Henry David Thoreau: "They are all beasts of burden in a sense made to carry some portion of our thoughts." 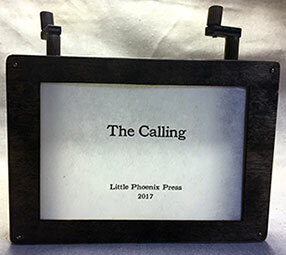 Asheville, North Carolina: Little Phoenix Press, 2017. Edition of 20. 6.5" high x 8" wide; scroll in box (crankie). Illuminated from behind by small flameless tealight that fits into oval slot at base. Letterpress printed using handset metal type, Bookman Old Style. 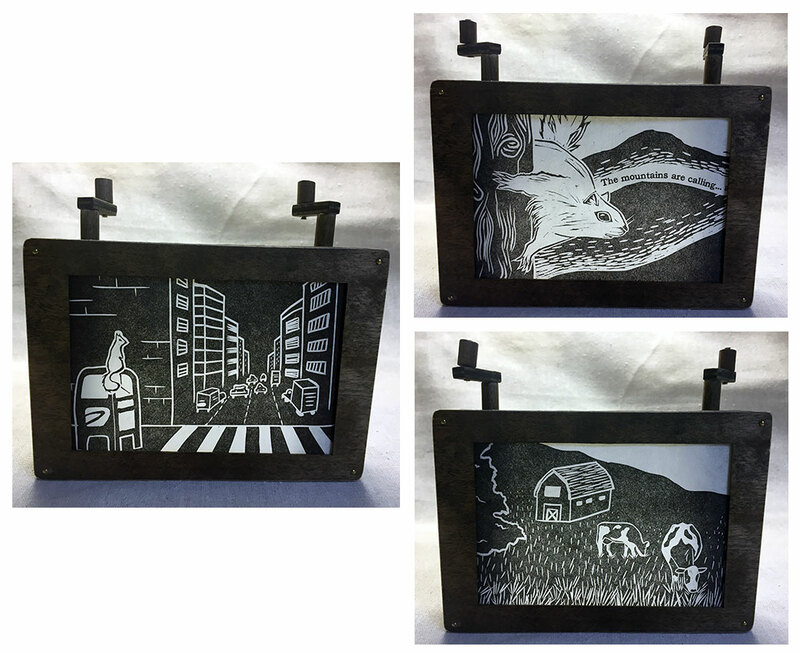 Images cut from Gomuban blocks and printed on Kozo Japanese paper. Wooden framework and base with two rotating handles at the top. Signed and numbered by the artist. A story about a city squirrel that finds his way to the mountains. The quote is from a letter by John Muir to his sister in 1873. "The mountains are calling … and I must go"
Jessica White: "Crankies are a part of the rich history of storytelling with panoramic pictures, especially popular in the 1800s. These were used as traveling forms of entertainment and education, and were often part of evening gatherings where the crankies would be illuminated by candlelight. They are, in a way, the first moving pictures'." 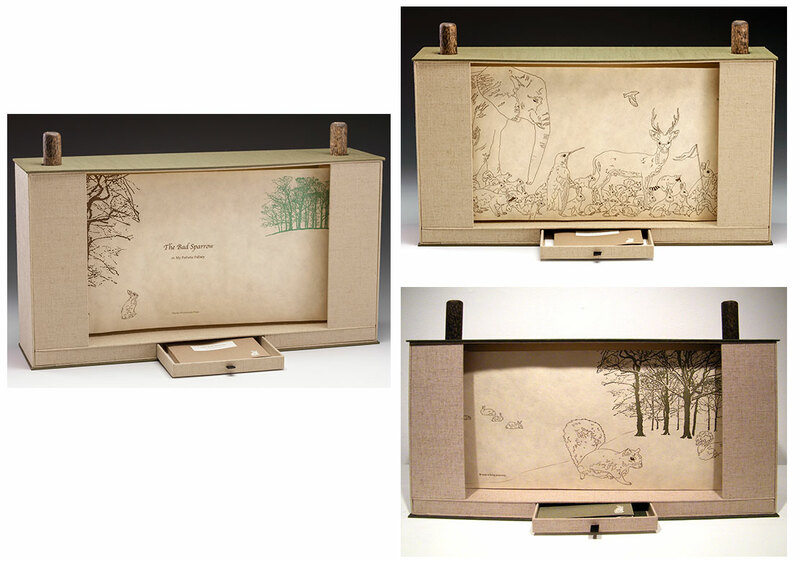 6.5" high x 8" wide; scroll in box (crankie). Illuminated from behind by small flameless tealight that fits into oval slot at base. 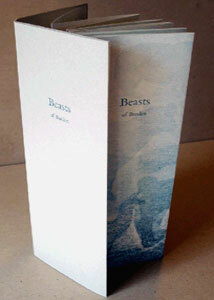 Letterpress printed using handset metal type, Century Schoolbook. Printed on Kozo Japanese paper. Wooden framework and base with two rotating handles at the top. Signed and numbered by the artist. A quotation celebrating writers, poets, and literacy. Source of quote unknown but often attributed to Benjamin Franklin or Karl Marx. "With 26 soldiers of lead, I can conquer the world." Iowa City, Iowa: Jessica White, 2005. Edition of 10. 6.5 x 5.75" case. 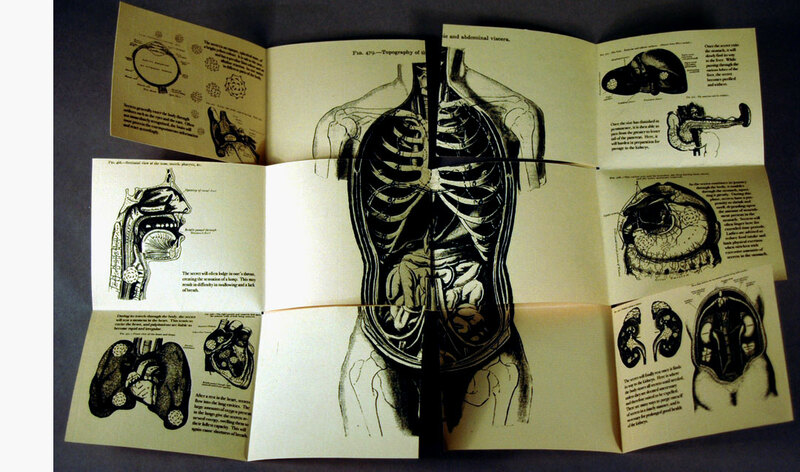 Images from 1903 Gray's Anatomy. Printed on Canson Ingres.Fold out pages similar to a flutter construction. Jessica White: "The images are from the 1903 edition of Gray's Anatomy, and yes, the title page echoes the wording from that book, with slight changes such as my name inserted as the author (J.C. White). The rest of the text is original (by me), as well as the drawings of 'secrets' that are integrated with the anatomy images. The book is essentially about the ways that I imagine secrets enter into and affect a person physically before becoming lodged, maybe permanently, in the kidneys. This idea came up during a time when a friend of mine was dealing with kidney stones." Text: "The secret will often lodge in one throat, creating the sensation of a lump. This may result in difficulty in swallowing and a lack of breath."